We have for several years now heard about our military’s and intelligence agencies’ use of unmanned drones to conduct secret surveillance of our geopolitical adversaries and terrorists across the globe. We may even take comfort in the use of these high-tech mobile video cameras hovering above a terrorist hide-out to foil a plot against our country. What may be less comforting to employers in the U.S., however, is that OSHA seems to have borrowed the playbook from our spy agencies to assist their inspectors in conducting inspections of U.S. workplaces. 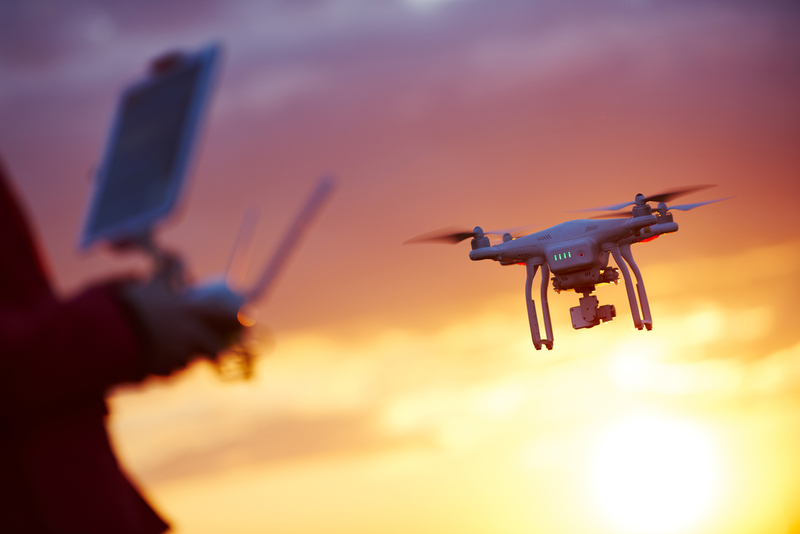 On May 18, 2018, OSHA issued an internal policy memorandum to its field offices, announcing that it has begun using Unmanned Aircraft Systems, commonly referred to as drones, to assist with worksite enforcement inspections, as well as for technical assistance and training purposes. For now, OSHA’s new drone policy requires “express consent from the employer” before a drone is deployed in an inspection, but that limitation is simply a policy decision that can change with the political winds blowing in Washington, DC, or ignored by the agency without explanation as we recently saw with OSHA’s “Look Back” policy for issuing Repeat citations. On Tuesday, April 16, 2019, at 1 pm EST, join Kate M. McMahon of Conn Maciel Carey’s national OSHA • Workplace Safety Group and Lindsay A. DiSalvo of the firm’s national Labor & Employment Practice for a complimentary webinar: Responding to 11(c) Safety Retaliation Complaints and Notices of Alleged Hazards / Employee Safety Complaints. 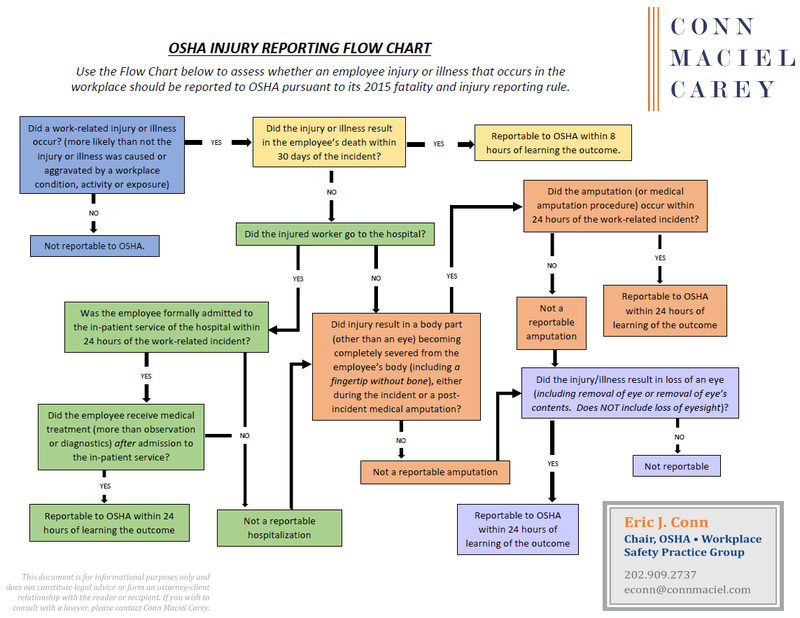 More than two years after OSHA published the E-Recordkeeping Rule, the agency finally revealed some of its plans for how it will utilize employers’ 300A injury data collected under the new Rule. In late October 2018, OSHA launched its new Site-Specific Targeting Enforcement Program, which outlines how the agency will select non-construction establishments for programmed inspection. OSHA will create targeted inspection lists based on employers’ higher than average Days Way, Restricted or Transfer (“DART”) injury rates. OSHA will also include a random sample of establishments with lower than expected injury rates for quality control. Thus, all employers covered by OSHA’s E-Recordkeeping Rule may be subject to an SST inspection. OSHA’s enforcement authority, specifically as it relates to the agency’s ability to expand an unprogrammed inspection beyond its original scope, has been limited, at least for employers in the Southeast. Late last year, in United States v. Mar-Jac Poultry, Inc., the U.S. Court of Appeals for the 11th Circuit affirmed a district court decision to quash an administrative inspection warrant that would have permitted OSHA to expand an inspection of Mar-Jac Poultry, Inc.’s (“Mar-Jac”) poultry processing facility in Georgia, initiated as a partial scope inspection in response to a single, specific reported injury, to become a comprehensive inspection under a Regional Emphasis Enforcement Program. This decision is important for employers because OSHA’s inspection authority has generally been understood to be quite broad, and judges have generally deferred to OSHA when applying the applicable administrative probable cause standard to OSHA’s inspection authority. But in Mar-Jac, the 11th Circuit determined that an unprogrammed inspection initiated as a result of a specific reported injury could not lawfully be expanded to include other areas of the facility, other hazards unrelated to the specific reported injury, and other aspects of Mar-Jac’s safety program, because the evidence presented by OSHA in support of its warrant application was inadequate to establish reasonable suspicion of the presence of violative conditions unrelated to the reported injury. As we have reviewed previously on the OSHA Defense Report, federal OSHA’s Rule to “Improve Tracking of Workplace Injuries and Illnesses” (aka the E-Recordkeeping Rule) requires small employers that operate in certain “high hazard industries” and all large employers to proactively submit their electronic injury and illness data to OSHA through a web portal – the Injury Tracking Application (“ITA”). When federal OSHA promulgated the Rule in 2016, it built into the Rule a mandate that all State Plans adopt substantially identical requirements within six months after its publication. Implementation of the federal Rule, however, has been mired in difficulty from industry challenges, shifting guidance, informal changes, extended deadlines and mixed signals about the future of the rule as we transitioned from the Obama administration to the Trump administration. As a result, numerous State OSH programs failed to initially adopt the rule. After some headbutting with federal OSHA, almost all of the delinquent states, including California, have now implemented rules to “catch-up” to the federal OSHA data submission rule. 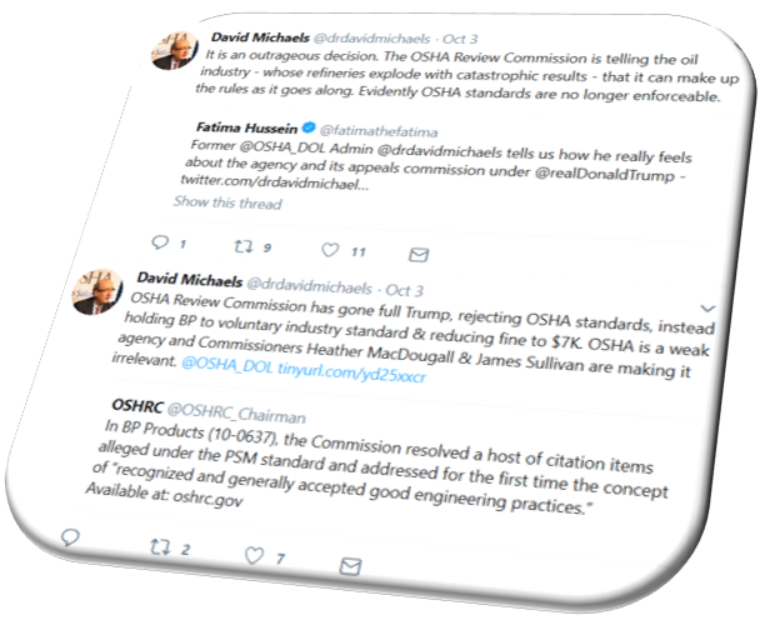 We are now two years into the Trump Administration, and we have seen a mixed bag of changes in the OSHA enforcement and regulatory landscape. We have watched some late Obama-era OSHA rules get repealed by the Congressional Review Act or delayed and amended through deregulatory rulemaking. We have seen some efforts to boost up the VPP Program and other cooperative programs—the sorts of policy shifts at OSHA many expect in a transition to a republican administration. However, we have also been surprised by OSHA increasing the number of inspections, setting records for the number of $100K+ enforcement actions, and continuing to issue hard hitting press releases. And most surprising of all, OSHA still does not have a Senate-approved Assistant Secretary—the longest ever wait for a permanent OSHA Administrator. As we move into the out years of Pres. 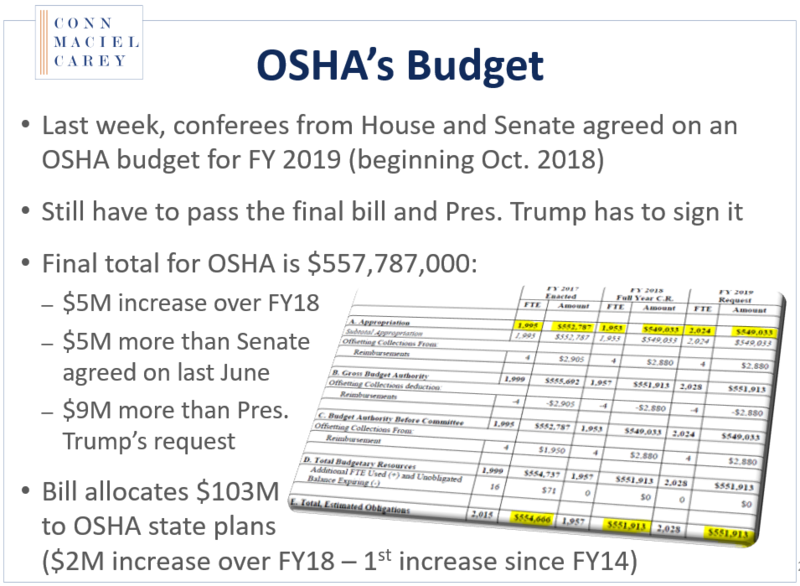 Trump’s first term, we expect more reshuffling of OSHA’s enforcement priorities and policies, and more surprises, so it is critical to stay abreast of OSHA developments. This complimentary 2019 OSHA Webinar Series, presented by the OSHA-specialist attorneys in Conn Maciel Carey’s national OSHA Practice Group, is designed to give employers insight into changes and developments at OSHA during this unpredictable time. To register for an individual webinar, click the registration link in the program descriptions below. To register for the entire 2019 Series, click here to send an email request, and we will get you registered. If you missed any of our OSHA programs, here is a link to our webinar archive. OSHA guidance states that “if an employee can perform their job functions in a manner which does not pose a safety hazard to themselves or others, the fact they have a disability is irrelevant.” But under the Americans with Disabilities Act, it can be difficult to determine when and how to accommodate a disability while also protecting safety of disabled employees and their co-workers. This assessment is further complicated when employers are unaware a disability may cause or contribute to a workplace hazard. It is important to understand the law in this context, especially due to America’s aging workforce. The ADA also requires medical information related to a disability be kept confidential, yet OSHA mandates certain information be provided on OSHA injuries and illness recordkeeping Logs. A disability may also impact whether and how an injury is recorded. Likewise, both the ADA and OSHA rules impact employee drug testing and handling drug test information. Therefore, it is critical for employers to understand the intersection between the ADA and OSHA. In addition to the electronic data submission requirements, the E-Recordkeeping also introduced (out of left field) some new anti-retaliation restrictions that were intended to eliminate employer policies that may discourage employees from reporting injuries, purportedly for the nefarious purpose of reducing the numbers of injuries the employer has to share with OSHA. These anti-retaliation provisions included very generic, vague language, but through a series of memos, interpretation letters, and other guidance, we have learned that the anti-retaliation elements primarily restrict employers’ use of safety incentive programs (prizes for injury-free work), post-incident drug testing, executive compensation and bonuses, and post-incident discipline. Although none of those terms even appears in the 2016 regulatory text, OSHA included a panoply of new restrictions impacting very common workplace policies and programs in the Preamble to the Final Rule. For more information about the controversial anti-retaliation elements of the E-Recordkeeping Rule, check out our previous blog post. Late last Friday, August 31, 2018, the D.C. Circuit unexpectedly granted Petitioners’ request to expedite the issuance of the Court’s mandate to strike down the delay of EPA’s 2017 RMP Amendments. As we previously reported, the D.C. Circuit held on August 17, 2018, that EPA acted improperly when it issued a final rule delaying the effective date of a certain set of amendments made to EPA’s RMP Rule (the “Delay Rule”). Providing for a full rehearing petition period, and absent any action from the Court, the mandate for this decision would have issued at the earliest on October 8, 2017. On August 24, 2018, however, Petitioners filed a motion to expedite, asking that it issue no later than September 7, 2018. Petitioners’ arguments focus on the public’s “strong interest” in the prompt issuance of the mandate due to “the serious and irreparable harm and imminent threats to public health and safety that EPA’s Delay Rule is causing,” and they point to the 14 months of delay that has already occurred as evidence of the need for expedited relief. And in a nod to current events, Petitioners claim that time is now of the essence because of the impending hurricane season, specifically mentioning the OIG’s investigation of EPA’s preparedness and response efforts to Hurricane Harvey in 2017. Under the Federal Rules of Appellate Procedure, EPA and the Intervenors are afforded 10 days to file oppositions to Petitioners’ Motion, so those oppositions had not yet been filed on August 31. After the Court issued the mandate late on Friday, August 31, several motions for reconsideration were filed by EPA and Intervenors, but the Court’s closure over the 3-day weekend left all the parties in suspense, anxiously trying to determine the implications of the decision. After a long weekend of suspense, the Court ordered EPA to return the mandate on September 4, noting that the responses to Petitioners’ Motion were not yet due. The Court also briefly noted that it appeared “that the court’s mandate inadvertently issued” the previous Friday. EPA returned the mandate on the same day. Today, the U.S. Court of Appeals for the D.C. Circuit handed EPA (and Industry) a significant setback in the long-running battle over the 2017 Amendments to EPA’s Risk Management Program (RMP) Rule (EPA’s companion regulation to OSHA’s Process Safety Management Standard). Specifically, in a per curiam order in Air Alliance Houston v. EPA, the D.C. Circuit held that EPA under the Trump Administration acted improperly when it issued a final rule delaying the effective date by 20 months (from June 2017 to February 2019), of a significant set of Amendments to the RMP Rule that had been promulgated in the final days of the Obama Administration. This ruling creates significant concern for the regulated community. The Amendments require major overhauls to they way covered employers implement their risk management plans. But EPA is still advancing a rulemaking to rescind and narrow those Amendments. Without this delay, there is tremendous uncertainty about whether or when to implement changes to those programs.